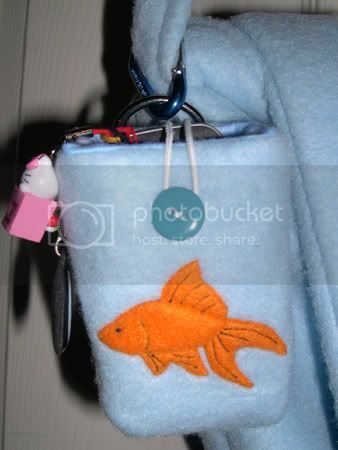 I just finished this fleece cell phone holder that I made to match my fleece goldfish bag. Instead of outlining the details in orange as I did on the original bag, I did them in black. Right now I can't decide whether or not that's an improvement! To attach the applique I used the same technique as the elephant pillow I made a while back, except I used a straight stitch on the edges instead of satin stitch. 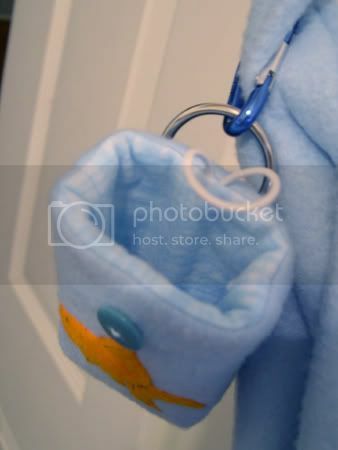 It's lined with plaid baby blue flannel and has a button and elastic loop for closure. I really like the flannel and I'm thinking about making another holder using the flannel as the background instead of the blue fleece. 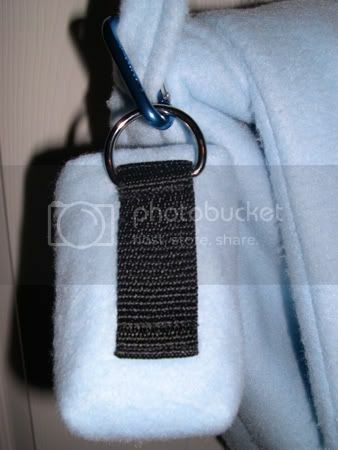 The problem with using fleece for an entire item is that after it gets used for a while it starts to pill. They do sell expensive no-pill fleece, but it's really meant for clothing and would probably be a waste to use on the things I make. Also, if I make any more of these I'll probably look into dying the elastic to match - I don't much care for plain white. On the back I attached some strapping so that it could be attached to a belt, and I also sewed in a D-ring with a carabiner so it could be hung from a purse strap or belt loop. Since t was a pretty quick sew, I'm thinking about trying to make some in different colors with different applique images. 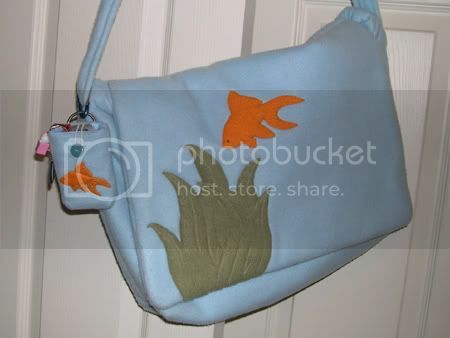 I'd also like to make other small items that matched them, like maybe a clutch or coin purse.